Athletes on the streets are fun but can be dangerous aswel. A ball rolling across the road and skating youth on the sidewalk: a common view in big cities. The solution is simple: Skatecity! 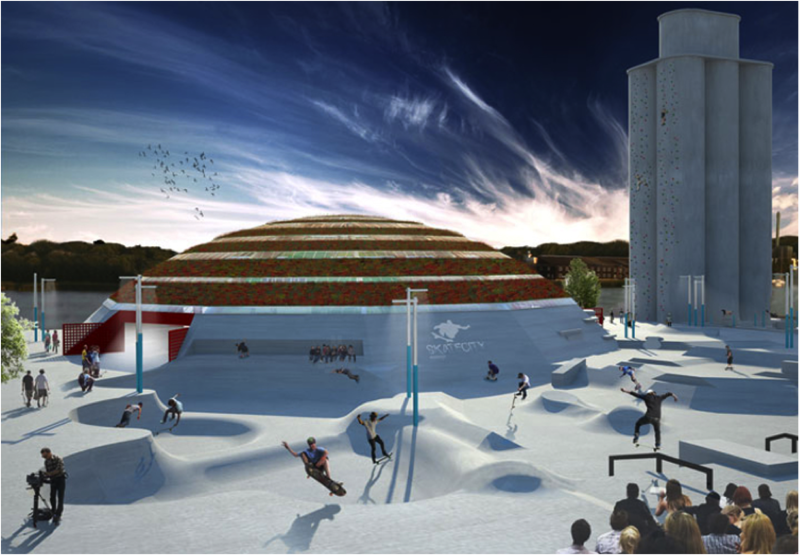 Skate City is designed by Glifberg + Lykke and Cebra Architects in 2011. Now, in 2014 the construction is still in progress. It’s located in Handerslev (Denmark). Skatecity will be 6.500 sq meters and lays next to the waterside. In some places of the skatepark is a basketball court and some benches to take a break. Skatecity consist several ‘bowls’ to be able to meet different levels of skating. The roof of this incredible park will be covered with green what will flourish in spring. Skatecity improves the Quality of Life because it provides the opportunity to skate and socialize with your friends in a safe, green en public place. And that is exactly why Skatecity is so cool! Besides Skatecity there are more multifunctional sport courts. For instance the 4D Cablean sport court. This court can rotate what makes it possible to place various sports courts on the same place.